Explore Daniel: Who Is Like God! 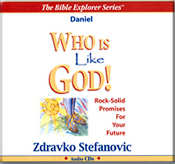 by Zdravko Stefanovic Ph.D.
Our Products >> Explore Daniel: Who Is Like God! by Zdravko Stefanovic Ph.D.
Rock-Solid Promises for Your Future! For centuries and even millennia the book of Daniel has been a source of courage and hope for believers. (Album of 12 CDs) Even skeptics have been impressed by the prophecies fulfilled with astonishing precision. Yet the powerful message of this book has often been obscured by biased and subjective approaches. Now you can explore the complete book of Daniel, verse by verse. Dr. Zdravko Stefanovic lets the Bible explain itself. Only in this way can the book of Daniel be clearly understood. Its life changing message will leave you not just astonished but completely transformed by an awesome God who speaks even today through the book of Daniel. Zdravko Stefanovic Ph.D. ... in Biblical Studies, has taught the Old Testament, Bible Languages (Hebrew and Aramaic) and Biblical interpretation in Europe, Asia, and North America. The author of three books and a number of articles published in scholarly journals and popular magazines, he also enjoys holding seminars on various Bible and mission related topics enriched by missionary experience in East Asia.